E-mail us for information if you are interested in joining us on a comfortable ride into the future of light weight campers. Please sign up as a friend on our page. 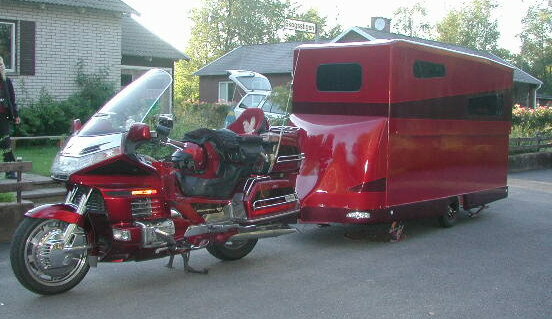 Swedish custom built quality campers or cargotrailers, in extreme lightweight exotic space age materials. Can be designed to any specifications for car or motorcycle. We built to your countrys specific laws and regulations. Target wheight for prototype # 3 is 100kg/220lbs. or lower. Keep in mind that this is just a PROTOTYPE built strictly to test the size and weight after a solo motorcycle, NO 100% effort has been made to make a perfect finish, we simply put this unit together in 15 days to try it out on a 3 week vacation. MANY changes and upgrades will be made to this camper or taken in consideration for prototype 3. Copyright � 2008 GOLDBRAND. exlusive rights. Updated: 11 May 2014 .